Comfort your baby's fussiness and gas, due to lactose sensitivity, with Similac Sensitive® - it has an easy-to-digest blend of carbohydrates that's gentle on your baby's tummy. Similac Sensitive has EarlyShield to support your baby's developing immune system, brain and eyes, and strong bones. 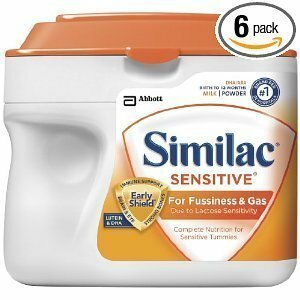 Designed to be closer to breast milk, Similac Sensitive also has a unique blend of Lutein & DHA. Lutein & DHA support the developing eyes and brain.